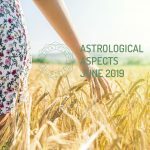 June 2019 presents a period of great emotional tension, due to the beginning of the retrogradation of Neptune in the sign Pisces (21/06), and the entrance of the Sun in Cancer (21/06). What does this mean in terms of the astrological transits of June 2019? Astrologically, Neptune is related to unconditional and universal love, while the Sun in Cancer speaks of family, (first attachments, roots, clan). The retrogradation of Neptune in Pisces raises situations related to sacrifice, illusions and evasion of reality. The individual manifests himself much more sensitive to external events. Moreover, the entrance of the Sun in Cancer highlights the importance of the familiar, not only as a group of people united by ties of blood, but as everything that you know, and conveys security. Here are some of the planetary events that will affect the astrological transits of June 2019. The New Moon in Gemini, during June 2019, favors participation in short courses, social interactions (making new friends), and the launching of projects (bringing ideas to the material plane). This lunar event can be seen as the necessary impulse to move from thought to action, that is, to transcend the stage of analysis and start working on the desired goal. Frivolity. Inconstancy in the sentimental relations. With Venus in Gemini, greater importance is given to the intellectual aspect of the other (thoughts, mental process) than to physical appearance. This transit reinforces the energy of the New Moon in Gemini of June 3, so it motivates interaction with new social circles, artistic creativity, curiosity and flirting. Practical ingenuity associated with art. Link with nature. Connection with the gifts of the spirit. Excessive dedication to work can transform you into a hermit or isolate you from the environment. Seduction as an element of enjoyment. However, Eros en Libra seeks stable (and intimate) relationships rather than games and adventures, a companion to whom to turn for advice and passion. Commitment to what your creative passion awakens. Search for recognition (by the partner or couple), before the expression of natural talents. Beware of the level of exigency within relationships. Nebulousness. Susceptibility. Disconnection from reality. The desire to be in a relationship can lead the individual to sacrifice their personal objectives, or accept circumstances that threaten their true happiness. It is important to be cautious about attempts at manipulation by others, or the tendency to assume the role of victim in order to get away with it (an aspect that is deepened due to the presence of Lilith in Pisces). Neptune retrograde in Pisces, during June 2019, is a positive period for those who want to make a spiritual retreat, or study sacred texts and teachings, on an individual basis (alert to false teachers and sects). Contact with roots (family, country). Emotiveness. Introspection. During this stellar transit, it is convenient to cultivate perseverance in all areas of life, without becoming discouraged by the appearance of obstacles. There is creativity in exposing ideas to others; however, pride and prejudice may prevent the initiative from evolving. The level of receptivity to the experiences of others will be a determining factor for success.